This was a sort of last minute cosplay plan (and when I mean last minute cosplay plan, it was decided two months on advance of the con). My friend Locobu and I were going to attend Frostcon in Toronto and we decided that we should get together a group cosplay. We were debating on different pairings when one of her friends said that she was going to cosplay the Witch of the Waste which led us to choose a Howl (me) and Sophie (Locobu) pairing. It was great fun to be a fabulous wizard for a day! Shirt - Howl's shirt is really large and billowy about him so I decided to use a men's medium sized pattern to make the shirt. I chose to use Butterick's B4574 pattern. I used a white poly cotton material that I got for a super cheap price. I followed the pattern instructions all the way to the last sleeve step. Instead of adding an elastic cuff, I added an interfaced cuff using this tutorial here. The cuffs are kept closed by large hooks and eyes. I also added a ruffle on the blouse following the edge of the interfacing on the inside of the shirt. The ruffles was finished by sewing a white ribbon over the top to keep it from fraying. Jacket - Having never made a jacket before I started off by looking through my patterns to work off of. I took Simplicity's 5840 view B as a base for the jacket. 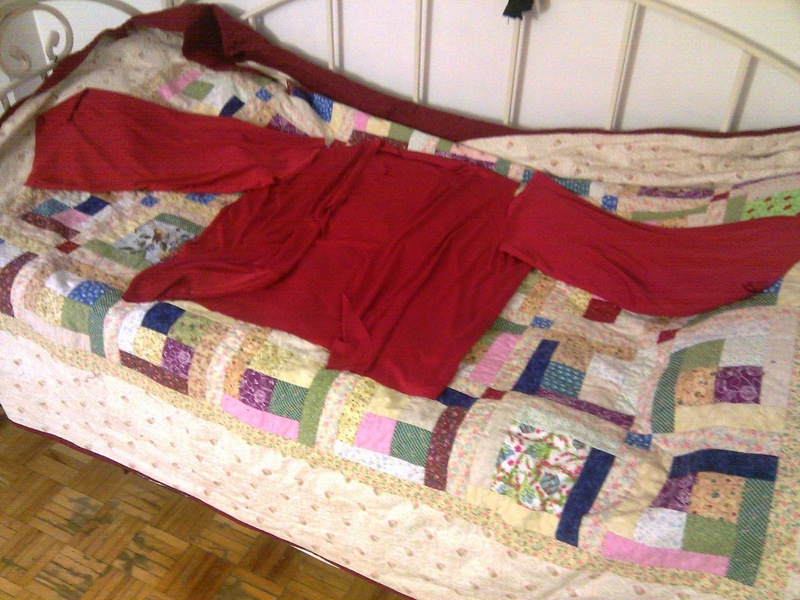 I modified the robe pattern so that I would have a shoulder seam rather than a yoke seam along the front and back. I also adjusted the length of the pattern so that it ended at around my hip level. 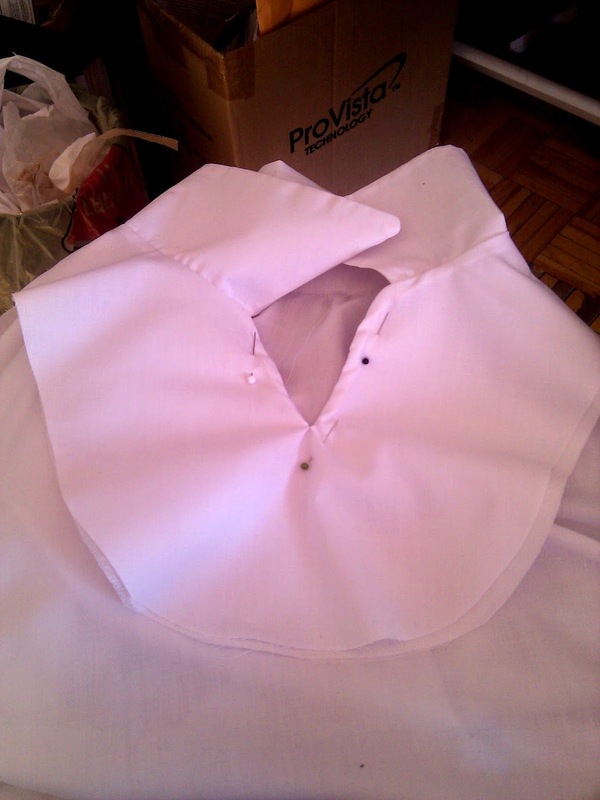 Then I added a collar to the pattern and modified the sleeve to have a false cuff on the outer layer. 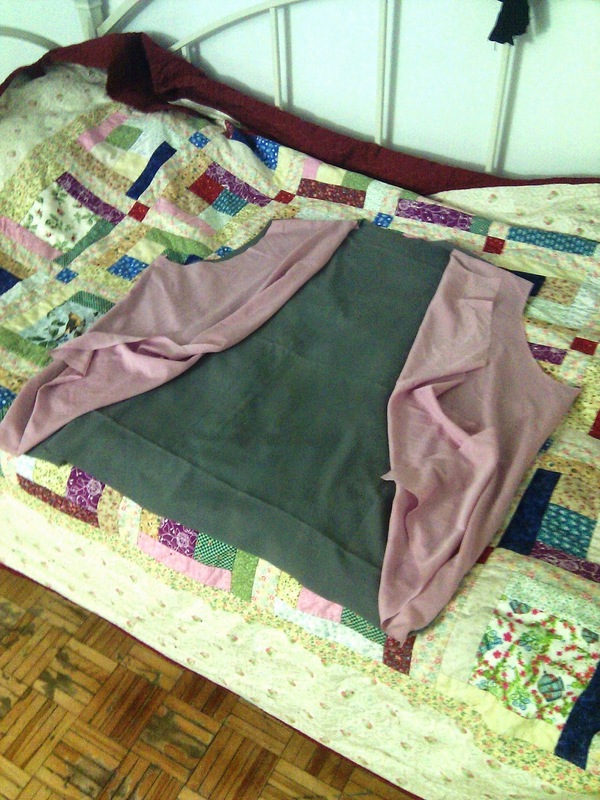 The main body of the jacket was made from a pink fabric of unknown fibers and grey polyester fabric. 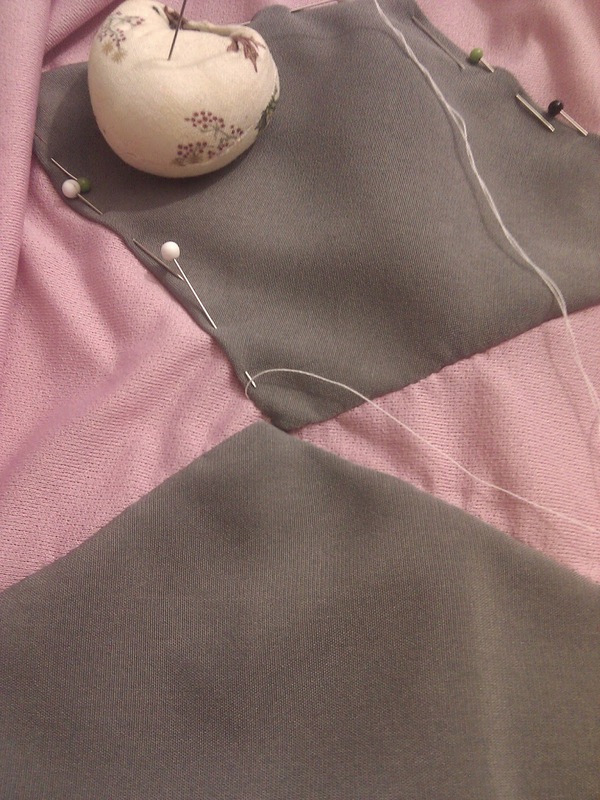 I hand sewed each grey diamond applique using a slip stitch. I figured that I would got for a quilting type of applique because I didn't want my stitches to be obvious (such as satin stitching). The applique took the majority of the time constructing the jacket. I had to sew over twenty individual diamonds! The end look was totally worth it though. The sleeves were constructed with the same pink fabric, a white poplin and a yellow poplin. The yellow "trim" was treated as a sewn in stripe for the sleeve. The lining was made from a red stretch material and it was attached to the jacket before the collar was attached. The neckline was left open on the jacket. The collar was also lined with the bottom seam left open to match the jacket. The collar was sewn to the jacket matching the outside layers together, then pressed and slip stitched closed on the lining side. The yellow bias along the collar and opening of the jacket was sewn on last. Pants - I was lazy and bought the pants. Unfortunately the zipper doesn't work so well so I had to sew a Velcro strip in the front to keep it from opening up. They are so comfy though! Boots - These were also bought. At first I thought they were super comfy but I realized that after wearing them for a day that my feet would start hurting. I guess I might have to invest in an insole for those boots. They were so perfect for the character though, I just had to get them! Jewel - It just so happened that I owned a blue jewel necklace for the longest time and I never wore it. I kept it for some reason and it eventually ended up being the best jewel for Howl! 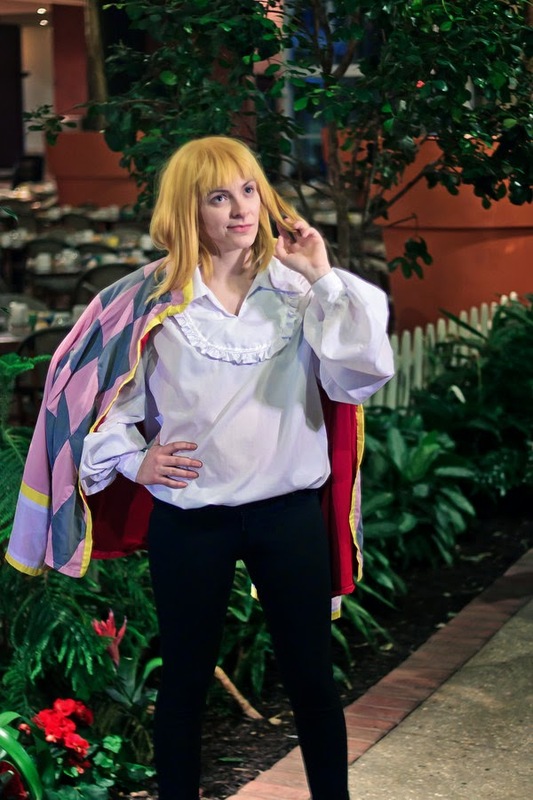 Wig - I used Arda Wigs' Inigo in light blonde for Howl. It had some weird curls at the bottom of the wig so I decided to try the hot water method for straightening a wig. It worked great and my wig is pretty straight now! I messed up with cutting the bangs because for some reason it looked straight on my wig head but when I would try it on the bangs were never straight. 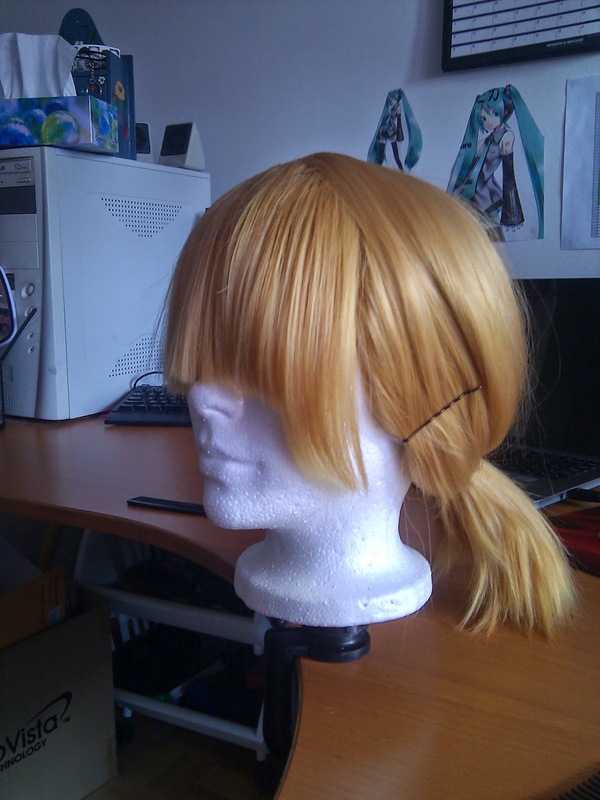 I eventually had to finish the bangs while wearing the wig.